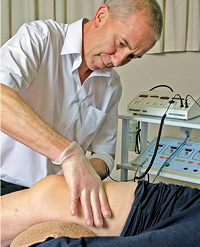 DEEP OSCILLATION® is a patented electromechanical therapeutic procedure using resonant vibration of the tissue with DEEP OSCILLATION® equipment from Physiomed, Germany. A special design makes it possible, using electrostatic attraction and friction, "to produce mechanical vibrations in treated tissues of the body, not only at the skin on the surface but also in deeper tissues" (Brenke and Siems 1996). Schönfelder and Berg (1991) refer to a "penetrating vibration and pumping effect deep into the tissue". The frequency can be varied in the range from 5-250 Hz. The treatment applicator/or vinyl gloved hands and electrode worn by the therapist and the patient are connected to the equipment (voltage source). A vinyl film between the applicator head/or the gloves and the patient functions as a dielectric. This results in a weakly conducting capacitative layer between the contact surfaces. In action, pulsed electrostatic attractions draw the tissue to the applicator and release it at the rhythm of the chosen frequency. The therapist sets the pressure gradient, speed and direction of the movements. The patient can treat himself if appropriate with applicators. The treatment procedure is characterised by minimal external mechanical effects, which allows it to be used in cases of acute pain, fresh injuries and in treatment of wounds. Numerous pilot studies have demonstrated pain reduction, minimisation of oedema and anti-fibrotic effects. It is commonly used for the treatment of Lymphoedema (Jahr, S., Schoppe, B. and Reißhauer A. (2008) Effect of treatment with low intensity and extremely low frequency electrostatic fields (Deep Oscillation®) on breast tissue and pain in patients with secondary breast lymphoedema. J. Rehabil. Med. 40, 645-650). "... deep oscillation massage is safe and well tolerated in patients with FMS and might improve symptoms and quality of life rather sustained."